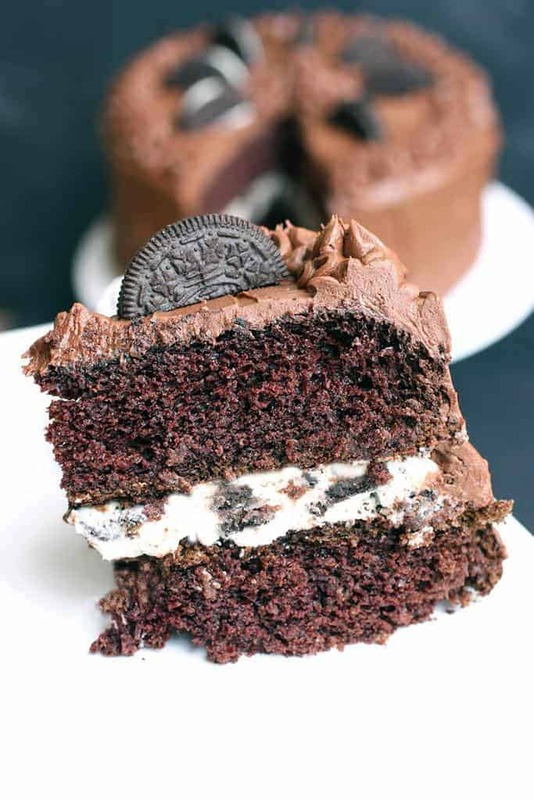 Chocolate Cake with Oreo Cream Filling is a two layer-cake with a creamy Oreo filling and chocolate buttercream frosting. 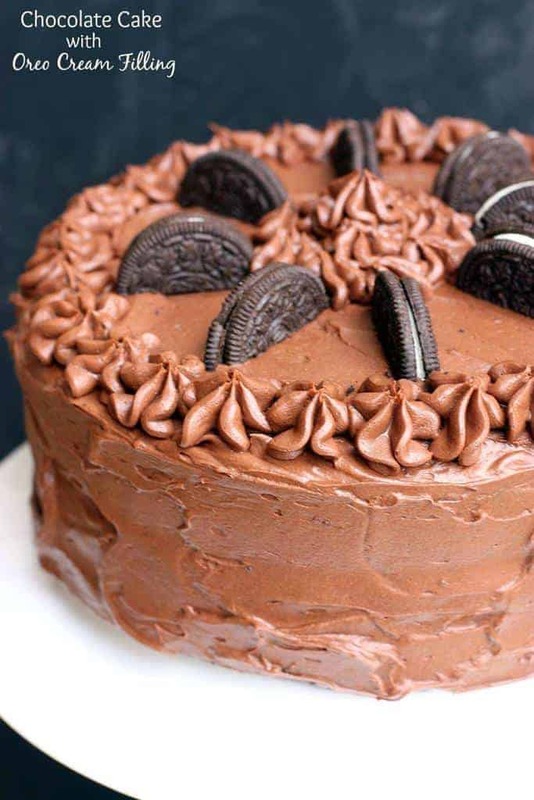 An Oreo lover’s dream! If you follow me on Instagram you may have seen my little sneak peak of this amazing Chocolate Cake with Oreo Cream Filling that I made for my husband’s birthday last week. This is the first year since I’ve known him that he hasn’t had what we call “dot cake”. The funfetti boxed cake with the rainbow chip frosting. Please tell me you’re familiar with Betty Crocker’s rainbow chip frosting?! We pretty much went into depression at our house because they discontinued making it! Yes, I’m all about cooking from scratch, but seriously, that rainbow chip frosting was the best store bought frosting invented. And without warning, BAM! It’s gone. So sad. 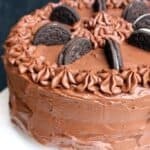 Chocolate Cake with Oreo Cream Filling is a two layer-cake with a creamy Oreo filling and chocolate buttercream frosting. 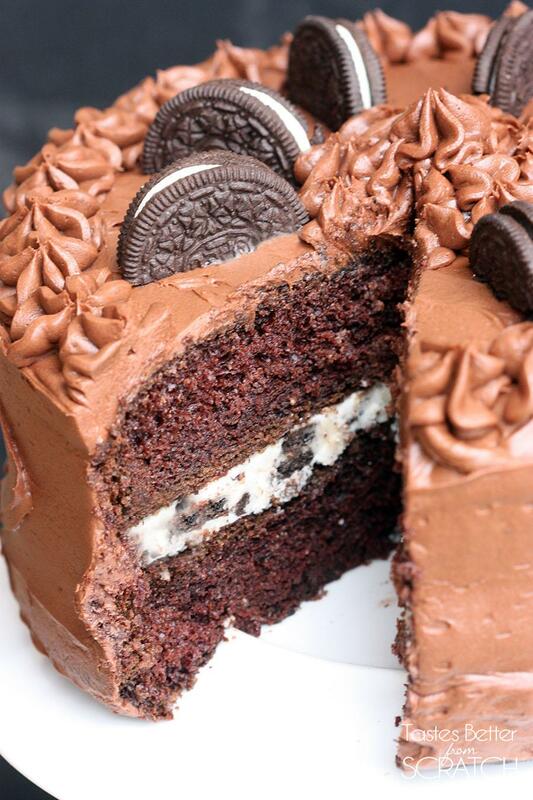 An Oreo lover's dream! In a large mixing bowl combine the flour, sugars, cocoa powder, baking powder, baking soda and salt. Add oil, eggs, vanilla, milk and sour cream and mix until well combined. Reduce speed and carefully pour in the boiling water. Beat on high speed for 1 minute to add air to the batter. Divide batter evenly between the prepared cake pans. Bake for 28-33 minutes, or until a toothpick inserted in the center comes out clean. Add vanilla and milk and mix well. For thinner frosting add a little more milk. For thicker frosting add a little more powdered sugar. Fold in chopped Oreo cookie pieces. Spread filling over the top of one of the cake rounds. Top with the second cake round. Cover the cakes with chocolate frosting. Add cocoa powder to a bowl with the melted butter and mix well to combine. Alternately add powdered sugar and milk, beating until your reach your desired spreading consistency. Thank for giving a good recipe to make delicious chocolate cake. Have you ever tried to make chocolate frosting by heavy cream, butter and chocolate chips? It spends just 3-4 minutes. I really want to make this, but can you please put the ingredients in grams!! It would be really helpful. Salted or unsalted butter ? Hi Jasmin. I used salted butter. If you use unsalted, you could add a tiny pinch of salt if you want! Could I leave the cake with filling in freezer longer than 30 minutes? Yes! It would freeze well, wrapped well in plastic wrap, for up to 2 months. Do you think i could make this cake in a 9×13 inch pan in single layers? This should work. I would make the cake in the 9×13 and layer both frostings on top! I loved this recipe. The result was very rich and tasty. Some of my favourite cake shops and a couple that I am yet to try.